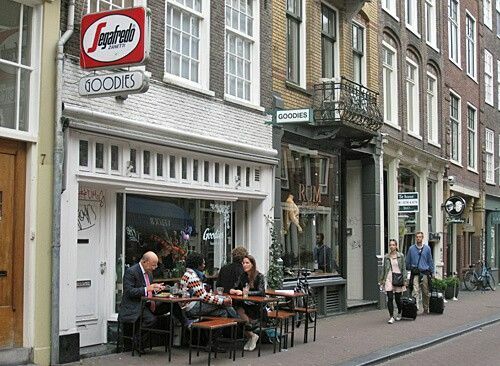 You will find many tantalizing goodies at Goodies in Amsterdam. This is the perfect café to stop by for a coffee or sandwich lunch. Prime location – right in the middle of the Nine Streets shopping area. Have your coffee al fresco and watch shoppers, cyclists and locals go by. No need to be an early riser as Goodies opens at noon. Whether you stop for coffee, lunch or dinner, Goodies is an excellent spot to start the day. Sit at one of the two outside tables and sip your coffee or fruit shake. A quick glance at the menu card will make you realise that Goodies has lots of appetizing goodies on offer, a large choice of sandwiches and bagels for lunch. Or maybe you prefer Salad of Forgotten Vegetables composed of salad with rucola, radichio, squash, yellow beet, oyster mushrooms oozing in a mushroom dressing with almonds. Be sure to have room left for the homemade cheesecake topped with strawberry sauce and vanilla ice cream, which in fact goes very well together with just a cup of coffee.